You can use the hosts file to block known malware, advertising or other unwanted domains. In macOS you can find the hosts file in /etc/hosts. To block a domain all you need to do is to append 0 example.com or 0.0.0.0 example.com or 127.0.0.1 example.com to your hosts file. So how do you manage your macOS’ hosts file? First always backup the original file. You can do that by copying the file to a different location or create a copy in the same location and rename it to hosts.bak ( or something similar that allows you to easily identify it as your backup ). Then you can create a second copy on your desktop, open the file with TextEdit, edit the file, save it and copy the edited hosts file back to the original location. You can use Gas Mask. A simple, free and open source hosts file manager for macOS. Local. Created and saved on your Mac. Combined. Combines local and remote hosts files. When you change the hosts file, Gas Mask will also flush the DNS automatically. That’s pretty much it. 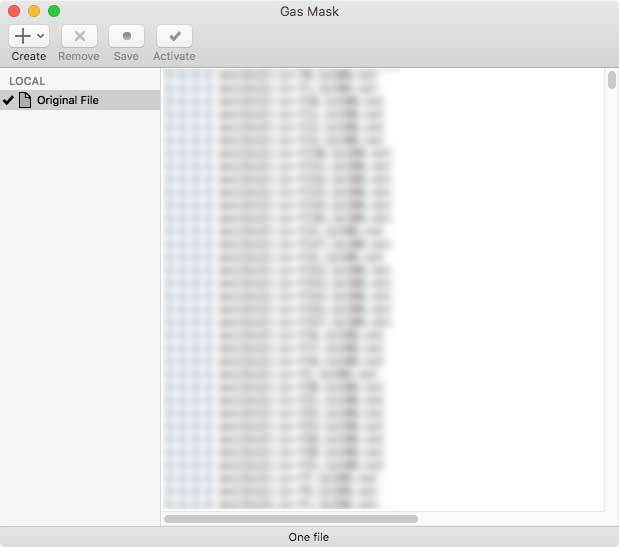 Gas Mask is a simple and intuitive hosts file manager that does its job.